Author(s) Hanley, Torrance C.; La Pierre, Kimberly J. As researchers try to predict the effects of human modification at all trophic levels and mediate the impact of rapid environmental change, it has become clear it is no longer a matter of agreeing that both bottom-up and top-down forces play important roles in diverse ecosystems. Rather, the question is: how do these forces interact across aquatic and terrestrial systems? Written by leading experts in the field, this book presents a unique synthesis of trophic relationships within and across ecosystems that is a valuable foundation for the development of cross-system, multidisciplinary research. It also provides new insights into population biology and community ecology and examines the interactive effects of bottom-up and top-down forces on biodiversity at each trophic level. 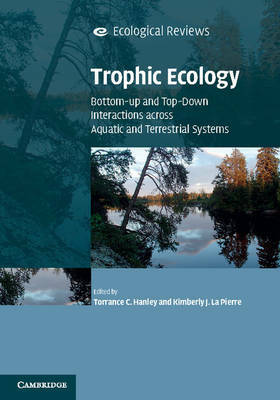 A one-stop resource for learning about bottom-up and top-down interactions, this book encourages discussion and collaboration among researchers to identify similarities and differences in trophic interactions across aquatic and terrestrial systems.